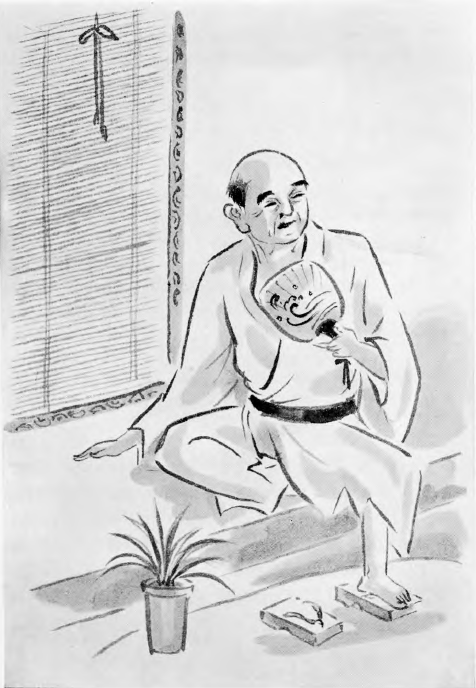 Hara hachi-bunme ni isha irazu. If your inside (hara) is eight-tenths full, you will need no doctor (isha). Hare mono ni sawaru you. It is like touching a swelling. This expression is used in reference to the utmost care with which you treat a person, especially a moody customer, as if touching a painful swelling (haremono) on your body. Hari hodo no mono o bo hodo ni iu. To talk of a thing no bigger than a needle (hari) as if it were as big as a stick (bo). Hari no ana kara ten nozoku. To look at heaven through a needle’s eye. To be crazy about a game is to be a poor hand at it. A poor hand at a game is as often as not very fond of it. Say to a Japanese “You are very fond of tennis, aren’t you?” or something of that sort, and in all probability he will admit it quoting this proverb. The day (hi) is closing (kurete) and the way (michi) is still long. To live with a fan in one’s left hand. Here is a man, presumably a company executive, in native garment, enjoying the evening cool at the veranda. The fan held in his left hand indicates that he is prover­bially in affluent circumstances. The bamboo blind, too, suggests the hot season. A ditty from the mouth of an arrested offender (hikare-mono). The humming of a tune by a convict on the way to the gallows indicates a pretentious display of sham noncha­lance by a doomed person in a desperate situation. This is a popular expression often on the tongue of a Japanese. “I am devilishly afraid…but I’ll sing, that I may seem valiant.” —Dryden. Hin no nusumi, koi no uta. Theft in poverty, poetry in love. Poverty makes thieves, love makes poets. There are quite a number of proverbs in praise of poets and poetry.